I've long been charmed by American culture around the turn of the 20th century, from about 1880 to 1920. 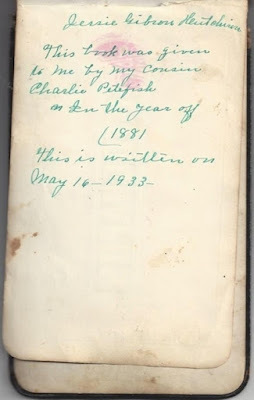 Little charms me more than this Autograph Book of my maternal great-grandmother, Jessie Belle Gibson Hutchison (1862 - 1952). 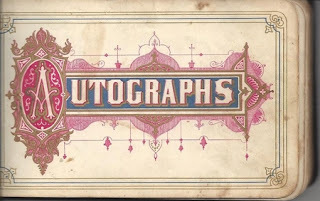 Per Wikipedia, autograph books originated in Europe in the Middle Ages to record family genealogy, and among college students. "Traditionally they were exchanged among friends, colleagues, and classmates to fill with poems, drawings, personal messages, small pieces of verse, and other mementos. Their modern derivations include yearbooks, friendship books, and guest books." In fact, Princeton University archives house a collection of "219 autograph books from 192 members of classes between 1825 and 1884. 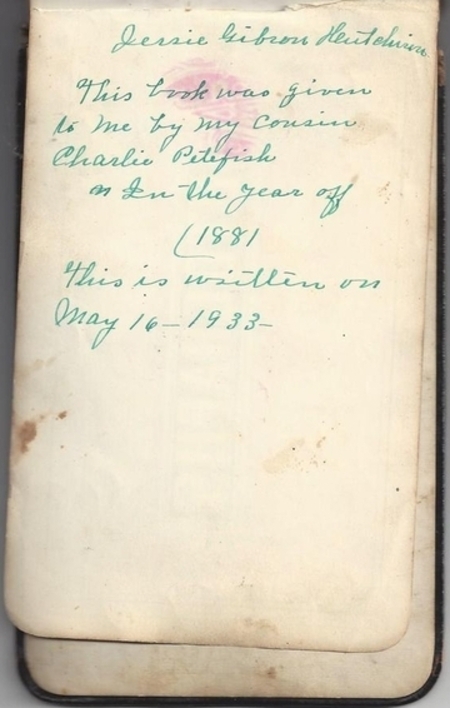 The books were used to collect not only the autographs of classmates, but also good wishes, bits of favorite verse, letters of farewell, or reminiscences of shared events during undergraduate years." I appreciate my great-grandmother's Autograph Book for the extraordinary genealogy record she later, at age 71, listed in it in 1933. But even more, I'm charmed by the eloquent, sweet, serious, clever, often funny autographs collected in the early 1880s from family and friends by 19-year-old Jessie Gibson of farming community Sigel, Kansas. 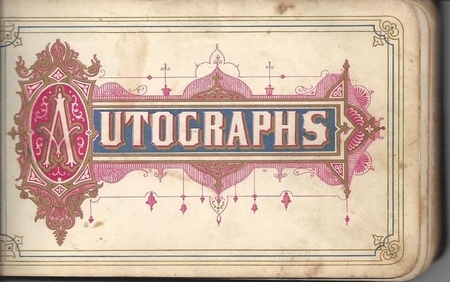 And it strikes me how much civility and graciousness Americans have lost in the last 150 years, from Victorian-era autographs books to Facebook today. That seeks thy good alone. And read it for thine own. 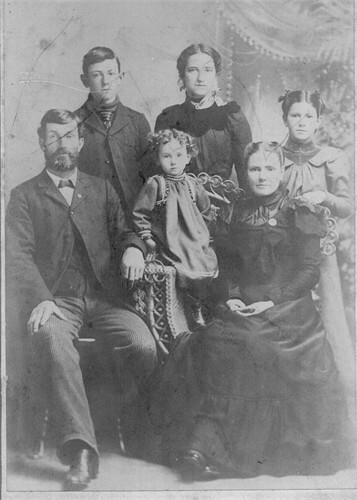 Laura M. Flagg, April 17, 1883"
And blow the ill with tear. in the presence of our Heavenly Father. Cool it, and forget me not. Effie Hutchison, October 27, 1883"
Youth will soon be gone. And laugh at our dreams ere our wakings begun. If something is lost, there is more to be won. As tis to part with you. Charming, indeed. I mourn the graciousness and innocence of those pre-Facebook days.